Good decisions rest on good inference. How do we interpret the data? How do we interpret what people say and do? Are they friend or foe? Is friend or foe a useful classification? What can a decision coach do to help decision makers improve inference? Chris Argyris and his colleagues at Harvard have been working on this challenge for over half a century. In the 1980’s they developed the concept of a ladder of inference. The ladder is one of the cornerstones of Action Science. On the surface the ladder is a straightforward concept. Simply put, we get into trouble with other people when we get too high up on the ladder and don’t make the effort to work our way down. Just listen to any public policy debate. “Taxes are bad. Entitlements are good.” Listen to your teenager. “You won’t give me the car because you don’t love me.” These are high level inferences that can lead to bad conclusions and ultimately bad actions. 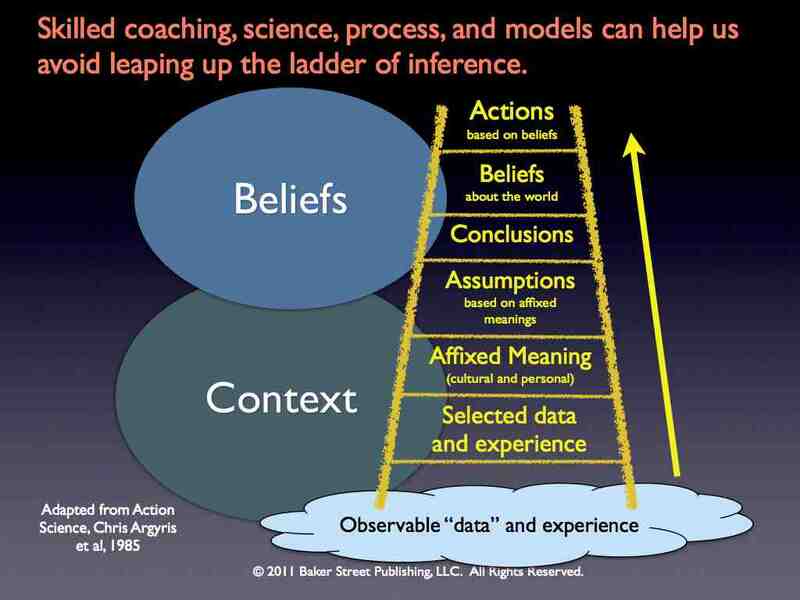 For a really clear explaination of the ladder I recommend a YouTube video by Ed Muzio, Ladder of Inference Leads to Bad Judgement . If you want to learn more about Action Science go to the book Action Science by Chris Argyris, Bob Putnam and Diana Smith. It was written in 1985. It is still the definitive work on the topic. 1) Combine advocacy with inquiry. 2) Illustrate your inferences with relatively directly observable data. Here’s where analytics or “Big Data” can help. 3) Make your reasoning explicit and publicly test for agreement at each inferential step. 4) Actively seek disconfirming data and alternative explanations. 5) Affirm the making of mistakes in the service of learning. 6) Actively inquire into your impact on the learning context. 7) Design ongoing experiments to test competing views. For a better understanding of this list and how to put it to work see the book, Action Science. If you want to put Action Science to work in your organization then contact Bob Putnam at Action Design.